Kaden Ellis and Dasha Russell will be two of eight competitors representing BC in Kingston this summer. Mar. 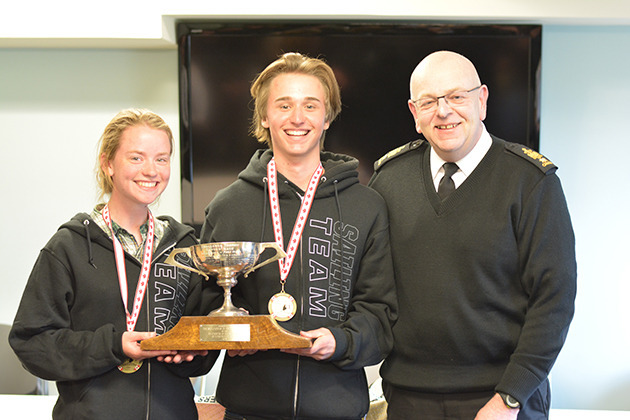 29, 2016 6:00 a.m.
Cadets Kaden Ellis (left) and Charlotte Clark (right) sailed into first place despite 19 knot winds during the national qualifying regatta last weekend in Victoria. Cadet Kaden Ellis of 81 Hampton Gray VC Royal Canadian Sea Cadet Corps in Nelson will be heading to Kingston this summer to compete in the National Sea Cadet Regatta after placing first in the 41st annual national qualifying regatta in Victoria last weekend. Dasha Russell, a Grade 11 L.V. Rogers student, had a strong third place finish and will join Ellis as part of the BC team. Twenty cadets from various locations throughout BC competed in teams of two during the three-day selection camp and regatta. These cadets all qualified for the national qualifying regatta by sailing at the provincials last October in Esquimalt. The goal of the national qualifying regatta is to select the eight strongest cadet sailors to form the Pacific National Team. The national qualifying regatta was held in partnership with the Royal Victoria Yacht Club, which offers tremendous benefits for both the staff and cadets. They are given the opportunity to learn from expert coaches on the water and afterwards with daily debriefs. BELOW: Cadets Charlotte Clark (left) of 5 Rainbow Royal Canadian Sea Cadets Corps in Victoria and Kaden Ellis of 81 Hampton Gray VC Royal Canadian Sea Cadets Corps in Nelson are presented the First Place Goulding Cup by CPO1 Mike Feltham, formation chief of Maritime Forces Pacific, for taking the top spot in the national qualifying regatta.